While CBS may have some of the biggest comedy series in primetime like The Big Bang Theory and Mom, the network has its challenges when it comes to establishing new ones. CBS introduced four new sitcoms this season and their fates have already been decided. Young Sheldon has been renewed for a second season while Living Biblically, 9JKL, and Me, Myself and I have been cancelled. As you might expect, their fates had a lot to do with the ratings. Young Sheldon airs after The Big Bang Theory and has done very well for the network. The other three have not been so fortunate. Me, Myself & I was pulled back in October 2017 after six episodes had aired. It was averaging a 1.0 in the demo with 4.96 million viewers but the ratings were dropping lower each week. It’s unclear how many installments were completed but hopefully, CBS will release them at some point. Living Biblically launched in February of this year and ran for eight installments before being yanked from the schedule. It was averaging a 0.70 in the demo with 4.21 million> The series was one of the network’s lowest-rated series. For the sake of its fans, let’s hope that the network will burn off the leftover episodes this summer. 9JKL was the luckiest of this cancelled trio in that CBS ordered three additional episodes and then let all 16 of them air. The show averaged a 0.96 rating in the 18-49 demo with 5.29 million viewers. 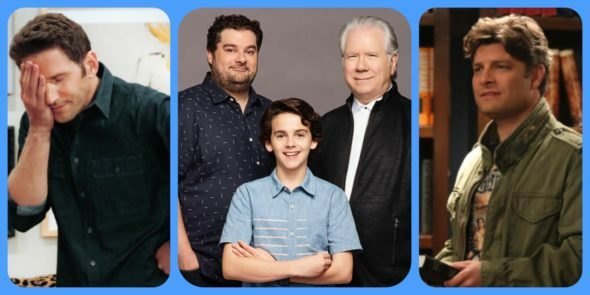 While the ratings for these three cancelled comedies weren’t strong enough to get them renewed, that doesn’t mean that they didn’t have millions of fans. We’d like to know if you could revive one of these three sitcoms, which would it be? Please vote for your favorite below and let us know what you think. The only one that I cared for at all was Me, Myself and I. The two others I never got through the first episode. Totally 9JKL! The best of the bunch & we totally enjoyed it. Have missed not seeing it! Oh, “9JKL”, for sure! It’s got Linda Lavin and Elliot Gould as the elderly parents! Ms. Lavin is a great actress and hasn’t had a hit TV show since her own one, “Alice” was on CBS from 1976-1985! The star of that show, Mark Feuerstein deserves to have a hit TV show that he is in. It needs to have a second chance! I loved 9jkl and me myself and I!! Really good upset that both are cancelled!! Of the four, Young Sheldon was the worst. But I didn’t like any of the four enough to keep watching. That 1.6 was with a 2.3 lead-in. That’s a nearly 33 percent drop. Plus, it fell to a 0.7, something that MWAP never did. Hands down Me, Myself and I! It was an original and fresh concept! I hope and pray they will at least make the final episodes available on the CBS app or possibly another network pick them up. Me, Myself & I – hands down! One of the better new shows. I was so disappointed when it was not renewed. It was unique, well written, well acted, etc. Give it a chance! Definitely Me, Myself, and I! Loved that show, sweet and funny, with unique storytelling method. I’ve been patiently waiting for them to finally play the unaired episodes. I’d love to finally see them. Me, Myself & I was the only one worth watching the others were complete garbage and canned laughter and just stupid writing. EASILY “Me, Myself & I”! I’m still in pain over that virtual cancellation! I like Living Biblically, but I still think about Me, Myself & I every day! I will die if CBS doesn’t air the remaining episodes! I was surprised to see 9JKL in the lead – that one can go, in my opinion. Me, Myself & I deserved so much better than what it got! I wish I could save 9JKL!! It was a very funny show!!! The other two were the egg bible, especially Me, Myself, and I!!! Without a doubt, I’d keep 9JKL! I thought it was a very funny show, while the other two were lame.